San Juan County is one of the 64 counties of the U.S. state of Colorado. As of the 2010 census, the population was 699, making it the least populous county in Colorado. 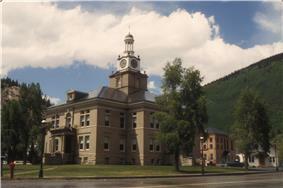 The county seat and the only incorporated municipality in the county is Silverton. The county name is the Spanish language name for “Saint John”, the name Spanish explorers gave to a river and the mountain range in the area. With a mean elevation of 11,240 feet (3426 meters), San Juan County is the highest county in the United States. As of the census of 2000, there were 558 people, 269 households, and 157 families residing in the county. The population density was one person per square mile (1/km²). There were 632 housing units at an average density of 2 per square mile (1/km²). The racial makeup of the county was 97.13% White, 0.72% Native American, 0.18% Asian, 0.36% Pacific Islander, 0.72% from other races, and 0.90% from two or more races. 7.35% of the population were Hispanic or Latino of any race. There were 269 households out of which 23.80% had children under the age of 18 living with them, 43.90% were married couples living together, 8.90% had a female householder with no husband present, and 41.30% were non-families. 36.80% of all households were made up of individuals and 4.80% had someone living alone who was 65 years of age or older. The average household size was 2.06 and the average family size was 2.63. In the county the population was spread out with 20.10% under the age of 18, 4.30% from 18 to 24, 28.10% from 25 to 44, 40.50% from 45 to 64, and 7.00% who were 65 years of age or older. The median age was 44 years. For every 100 females there were 110.60 males. For every 100 females age 18 and over, there were 112.40 males. The median income for a household in the county was $30,764, and the median income for a family was $40,000. Males had a median income of $30,588 versus $19,545 for females. The per capita income for the county was $17,584. About 13.50% of families and 20.90% of the population were below the poverty line, including 29.40% of those under age 18 and 7.10% of those age 65 or over. San Juan county is the only county outside of Alaska where walking is the most common form of commute to work. As of 2013, 33% of residents walked to work, 18% drove alone, 19% carpooled, and 18% bicycled, though the small population size introduces considerable margins of error to these statistics. As of November, 2006 the one and only local school had 53 students in grades k-12. ^ "Interactive: How Americans Get to Work". Flowingdata. Retrieved 2015-01-21.